Synchronous contraction of the left ventricle (LV) is required to optimize cardiac function. Regional timing of LV contraction is dyssynchronous in many patients with heart failure, and cardiac resynchronization therapy (CRT) is a treatment that can restore synchronous contraction. Patients are currently selected for CRT using surface electrocardiogram QRS duration as a measure of dyssynchrony. However, 30–40% of patients selected for CRT show no improvement. This poor response rate may be explained by the poor correlation between mechanical dyssynchrony and QRS duration. Better methods to quantify mechanical dyssynchrony in the heart may improve the poor CRT response rate. Dyssynchrony creates inefficient shifting of blood volume internally within the LV. This "internal flow" represents wasted energy due to the dyssynchronous motion of the LV walls. Measurement of internal flow may provide a better, more physiologic indication of dyssynchrony than existing methods, but there is currently no non-invasive method to quantify it. LV internal flow can be quantified from cardiac magnetic resonance (CMR) images and will be significantly different in patients undergoing CRT compared to healthy volunteers. Internal flow within the LV decreases volume in one region of the ventricle while simultaneously increasing volume in an adjacent region. This flow results in no net change in the global LV volume. Internal flow is equal to the sum of the regional volume changes minus the global volume change for each time frame in the cardiac cycle: IF(t) = ∑|ΔV(t) regional | - |Δ∑V(t) regional |. This difference is zero if no internal flow has occurred. The internal flow fraction (IFF) is the total internal flow as a fraction of the global volume change. We calculated IFF from regional volume curves of the LV generated from segmentation of a 3-dimensional shell of the endocardial surface of the LV derived from CMR images (Fig 1A). We developed methodology that utilizes cardiac magnetic resonance images to quantify internal flow in the left ventricle that results from dyssynchronous motion of the ventricular walls. Internal flow was significantly different between patients with dyssynchronous heart failure and normal controls. (A) Three-dimensional endocardial surface of the left ventricle divided into 18 regional volumes. (B) Internal flow fraction is significantly different in patients and normal controls. The endocardial surface was detected with a semi-automated level-set approach. The 3-dimensional LV endocardial surface was reconstructed and divided into 18 regional volumes: 6 rotational wedge-shaped 60° volumes at each of the 3 longitudinal levels (basal, mid-ventricular and apical) (Figure 1A). The anterior RV insertion point was used as the origin of rotational segmentation. The wedges intersected at the vertical axis, which was defined as the line between the apex and the center of the mitral annulus. The volume of each wedge-shaped region was calculated for each time step and internal flow fraction was calculated from these 18 regional volume curves. CMR images were obtained with a 1.5 T Philips Intera scanner using a 5-element phased array cardiac coil. Short-axis steady-state free procession (SSFP) cine images were acquired over the length of the LV during breath-holds. Slices were 8–10 mm thick with no gaps, and 20 time points were collected per cardiac cycle. Two-chamber and four-chamber long-axis images were also acquired. CMR images were obtained from 5 patients undergoing CRT (class III-IV heart failure, EF<35% and QRS duration >150 ms). These patients have a high likelihood of mechanical dyssynchrony. Five healthy volunteers were also scanned for comparison (normal CMR and 12-lead ECG). IFF was 20 ± 6% in the patients and 5 ± 1% in the normal controls (p < 0.001). An IFF threshold of 10% discriminated between patients and normal controls with 100% accuracy (Figure 1B). Figure 2 shows a representative patient demonstrating internal flow from the early-activated septum to the lateral wall. Internal flow in a patient with dyssynchrony. 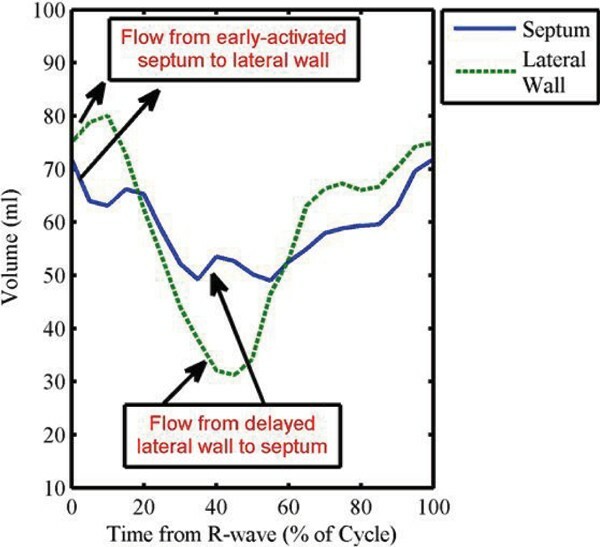 Representative patient with a left bundle branch block demonstrates internal flow from the early-activated septum to the lateral wall, followed later by reversal of flow from the lateral wall back to the septum Note that internal flow is occurring anytime the volume curves slope in opposite directions. This pattern was not seen in any of the normal controls. Internal flow fraction in the LV can be quantified from standard cardiac magnetic resonance images. Patients with dyssynchronous heart failure have 4 times the amount of internal flow within the LV compared to healthy controls. A threshold internal flow fraction of 10% discriminates normals from patients with dyssynchrony.